In 2016, we have settled a greenhouse for plants and a garden in the historical district of this flower, at Lalande district, in the north of Toulouse. In the past, this typical place has accommodated market garden growing. 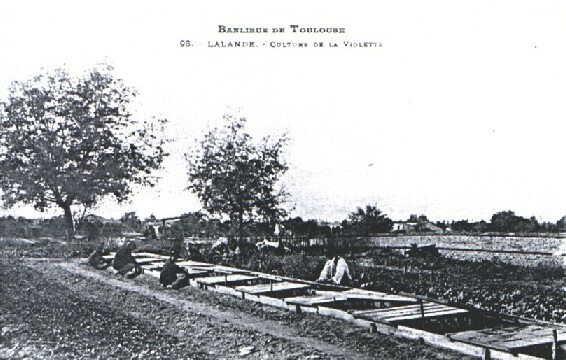 This district of Toulouse named « Lalande » was still rural during the 19th and 20th centuries. This building, typically from Toulouse, is made of pink bricks and pebbles from the Garonne River and it is the setting frame of the Maison de la Violette, garden side. This place is designed today to increase the value of the typically heritage from Toulouse, by relating the history of the flower growing from 1850 to the present day. 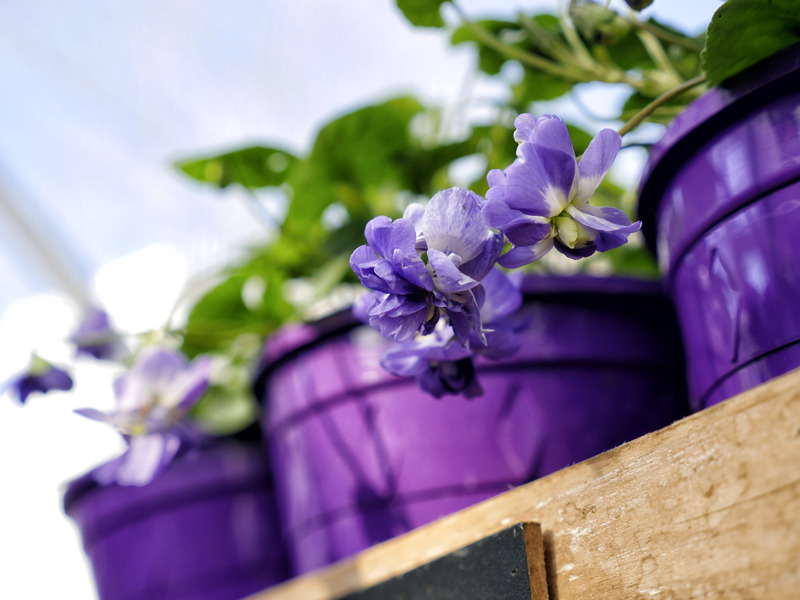 The violet greenhouse, by hydroponics, greets you for a special discover and an exhibition area will soon be added. It is one of the symbols of Toulouse and it has born its colours since 1985, when the appellation « Violet of Toulouse » became a registered trademark. This so distinctive flower, which is grown in the soil, under glass frames, has given the fame of Toulouse since 1850. At the beginning of the 19th century, more than 600 families lived on the production of the cut flowers, set for bunches, sold by weight. This fashionable flower was exported to England, Germany, Russia, even to Morocco, thanks to the Aeropostal service. The violet of Toulouse has been put in the spotlights, thanks to dances, annual contest of Miss Violet and presentation of bunches to important persons. Since the beginning of 20th century, violets have been crystallised in Toulouse. The perfume was created in the 30’s by the company of perfumes Berdoues, from Toulouse. In the 50’s, a local craftsman (Benoit Serres family) invented the liquor of violet. All these by-products sustain the fashion of the Violet of Toulouse, which was already well-known out of borders thanks to the selling of bunches in winter. 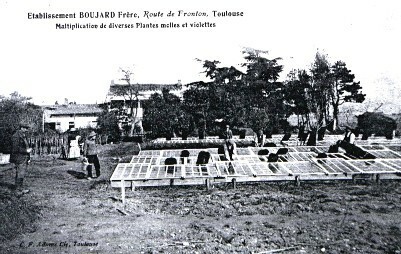 Nevertheless, despite this fame of yesterday, the Violet fall into disuse because of hard growing conditions, degeneration of the seedlings, the 1956 winter frost, the increased competition due to the opening and development of the International Market of Rungis (Paris), so many reasons which lead progressively to a loss of interest to this only flower and its almost disappearing. It’s necessary to wait till 1984, when the local Chamber of Agriculture and the Regional Council of Midi-Pyrenees decided to launch a research and studies program in order to clean up the degenerated seedlings. Afterwards, their reproduction will be checked in in-vitro process. By this way, the Scientifics have revived the production of Violets. These young seedlings were put in the hands of local producers, who, since then, have been carrying on the growing. From then on, this restored variety has been cultivated in pots, soilless, on shelves, shoulder-high, under cover. The “Violet of Toulouse” becomes a registered trademark. Nowadays, the production is feeble, hold by a few passionate producers who want to perpetuate this tradition. The association “Les Amis de la Violette” and the Fraternity of the Violet contribute to this revival through cultural events. The Violet of Toulouse is a winter perennial plant, which likes living outside. It is sensitive to the midday sun and prefers the shade. On summer time, trim the foliage to let it resting in June and July, do not forget to water it. Its particularity: it does not produce seeds, you have to propagate by cuttings to reproduce it, it means take with scissors the stolons and put them in specific compost to put down roots. The principal plant raised and gives every winter some beautiful double flowers, perfume, coloured mauve with a white heart.